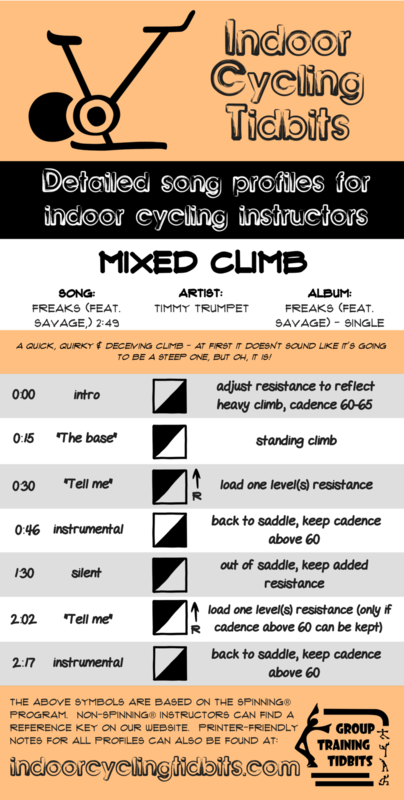 “Indoor Cycling Tidbits” is a weekly resource for indoor cycling instructors. For more info on what it’s all about, click here. This was a song that I knew I wanted to use for a long while before I could figure out how to use it. Every time I got my notebook out to program it, it always got put away with an empty page. Depending on who’s in the group (beginners vs. seasoned riders) I give an option to take the extra gear off at 1:30, and then add it back on again at 2:02. The way it’s written you add resistance on twice without any relief, so it can get a bit dicey. All the freaks looking for another mixed climb profile check out this one, or this one.